The unmistakable Jubilee Tower (pictured) sat atop the summit of Moel Famau is to undergo refurbishment works it has been announced. Flintshire and Denbighshire County Councils are working together to develop a programme of work to reconsolidate parts of the Jubilee Tower as some areas of the tower are beginning to deteriorate and access onto the tower has become increasingly difficult. The Jubilee Tower was last repaired in 1969, but since then it has received very little attention – despite being one of the most visited spots in both counties – getting over 200,000 visitors every year. The Jubilee Tower celebrated its 200th birthday in October, 2010. In 2009 Flintshire and Denbighshire Councils with support from the Clwydian Range AONB commissioned specialist conservation architects TACP to examine the condition of the building and to make recommendations for its repair and reconsolidation. Now, with support from the Heritage Lottery Fund through the Heather and Hillforts Project, work can begin to take place. It is hoped that one of the original corner bastions can be revealed – probably for the first time in over 100 years. 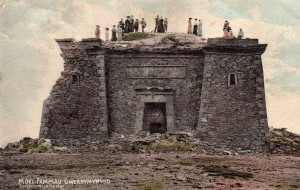 The original base of the tower has been covered up as parts of the tower collapsed over the years. A preliminary excavation last year showed that at least one of these bastions is still intact and work will start in the next few weeks to reveal it. Over the next few weeks the tower will be shrouded in scaffolding as the repairs get underway – but there will be opportunities to look closely at what is happening with a series of guided visits to the site. The work is anticipated to last until the end of May. Money well spent. I shall watch the developments in the coming months. Such an iconic landmark cheers me up when viewing from Wirral.